This website is best viewed in Explorer ,it doesnt seem to like Smartphone technology if you want to see all the poster illustration. Overseas destinations and Premium Services ( Express, Swiftair, AIrsure etc). and a small selection of used STO commercial items. Plus a box of PO used Registered covers to look through. These will be the standard A4 size posters covering Machin new issues, Postal Rates, Booklets and coils . Most of these can be found illustrated within the pages of this website. Also leaflets relating to Postal Rates and Premium services. Wants lists and enquiries are most welcome. So if you want that special item for your display or are just looking to expand your collection in another direction , I would be delighted to hear from you. I will be arriving in London by public transport so I will only have a large rucksack and item of hand luggage to bring stock. Postal orders most welcome . 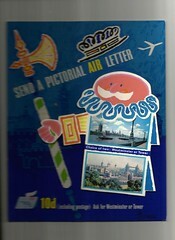 Post Office Posters, grille cards, dealer's posters & other items. .......looking to enhance your Collection ? Then you may have come to the right place ! I have been accumulating Post Office posters for over 32 years and many people have asked me to list them all. My initial response is that there must be thousands of items and where do I start. Well here is the start after 4 years I have added over 1000 A4 sized images and calculate that I have another 1000 images of larger posters to add. I intend to start by listing the A4 sized posters that appear in the Post Office counter screens. These posters are commonly referred to as "grill" or "grille" cards. They can cover any of the Post Office products or services, so I will focus on the commemerative stamps, definitive stamps, booklets and postal rates. Then move onto the dealer's and overseas agents products. It is not going to be possible to scan every item and catalogue it, so in the first instance I will deal with each section as a web-page and give examples of some of the items produced along with some idea of their distribution and the numbers produced. Th list the items and illustrate a percentage of them. Fortunately the Post Office has given most posters a reference number, making the task slightly easier. If you have any information to share, points to raise or items that you would like to see on this web-site , then please let me know. Two new images in one day ! Is this where it all began ? Thick cardboard. Stand up size approx 8"x10"
hence the reason he is in focus and the rest of the image is not. See the A3 version below left. 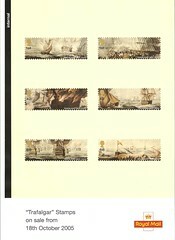 More internal posters come on the market and an early example of the 2005 Trafalgar example is shown below. The left margin reads "Internal". Exampes have been seen going back to 1999.
information relating to size ( A4, A3 etc) and date ( ie 10/84 ),this will be omiited for simplicity. 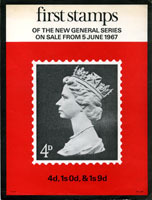 Where no reference number is given then the date of issue or start of service will be used, this particularly related to the Internal Posters in use since the late 1990s and currently still being issued.